As I have recently joined as a friend of Dulwich Picture Gallery I duly received my invitation to the Private View of “Art and Life 1920 – 1931” and made my first trip to Dulwich Picture Gallery on the 9th June. It was a very nice visit, but as I don’t drink alcohol, I was disappointed with the soft drinks option being water, and that was that. Need to email them and request Teetotallers are better catered for I think. It was a day of sun, and green. You were not allowed to take photographs of the paintings. Oh, so sad. No sense. It would have been handy for reference. But I will remember the colour, and the poetry, particularly of Winifred Nicholson’s paintings, which I liked the most. I have long admired the paintings of both Ben and Winifred Nicholson, but also very much loved the paintings of William Nicholson… but his were not to be seen… I am certain they must have had an effect on Winifred, in particular. I spent some time when at West Dean a few years ago enjoying “The Art of William Nicholson: British Painter and Printmaker – by Colin Campbell, Merlin James” which was published in 2004 by the Royal Academy of Arts. I would buy this book but unfortunately it is rather costly at £85! Info on William Nicholson below, taken from the above website. He was born 1872 and died 1949. Text credit included below. British painter, printmaker, and designer. He briefly attended Herkomer’s school in Bushey, then studied at the Académie Julian, Paris. Early in his career he worked mainly as a printmaker and designer, notably on some brilliant poster designs in the 1890s, done in collaboration with his brother-in-law James Pryde under the name ‘J. & W. Beggarstaff’. “Nicholson, Sir William” The Oxford Dictionary of Art and Artists. Ed Ian Chilvers. Oxford University Press 2009 Oxford Reference Online. Oxford University Press. I’ve just been looking at an image of this painting, and it has left me quite speechless… It is the emotional dimension and poetry of the painting which I love…each mark is tender and full of freshness and life. There is no need for moving images with paintings like this to see. The movement happens internally, and the spirit stirs at the sight, not of the illusion, for the picture is simply a vehicle, but because of the expression, which not only depicts an external scene, but traces the heart movements of the painter at the same time. I include this image with credit to The Public Catalogue Foundation. 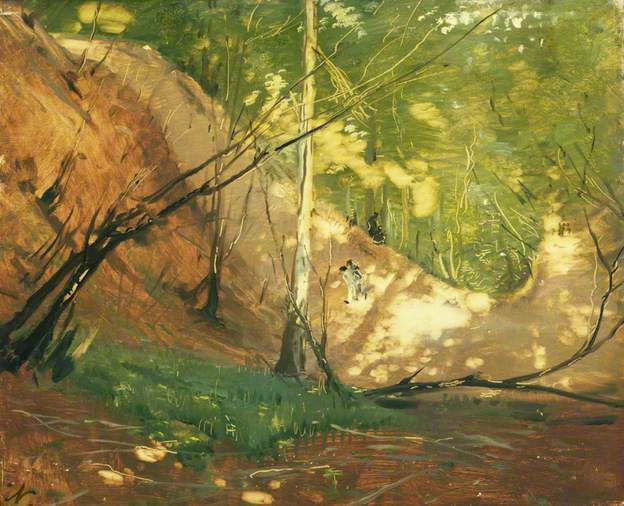 A Glade Near Midhurst by William Nicholson is copyright Elizabeth Banks. I just love it. It makes me want to paint immediately! I feel a bit lost right now with respect to my painting, but mostly because all the domestic things which need doing are running off with my time in their hands. Once I am doing it, all will be well. Painting doesn’t seem like a problem when I am doing it, only when I am not! Maybe the best problem to have then, better than the other way around. In the Dulwich Picture Gallery it was Winifred Nicholson’s paintings which caught my interest and provided the most enjoyment. 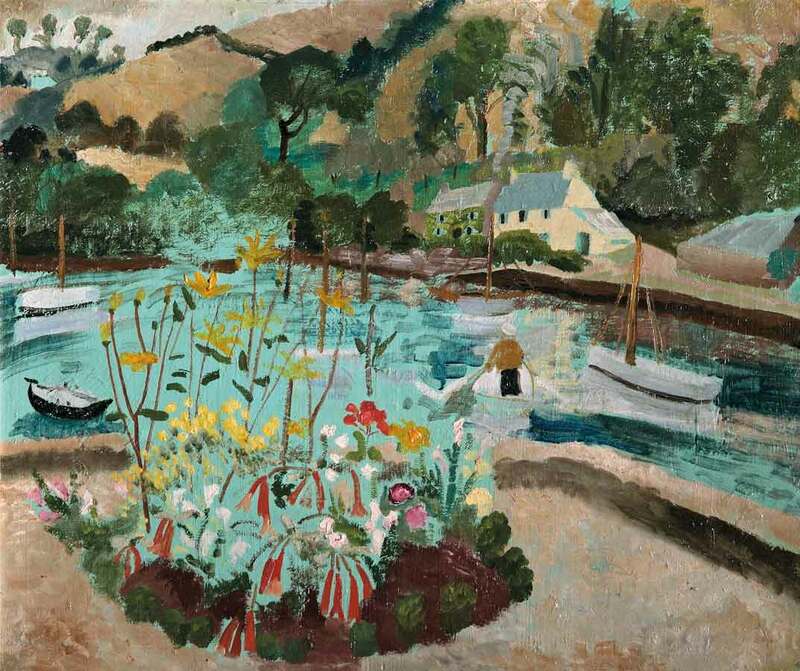 Winifred Nicholson “Summer1928” was just one of many examples with the surface of the canvas utilised in that wonderful way which brings a softness to the brightest colours. It is the feeling, so direct, so personal, that comes across. This is not painting for anyone else but herself. This is the best way. “Nicholson particularly enjoyed painting flowers and said: ‘I have tried to paint many things in many different ways, but my paintbrush always gives a tremor of pleasure when I let it paint a flower’. However, Nicholson was not concerned with botanical accuracy, but rather wanted the plants and flowers to signify the time and place in which they were painted. This painting with its gestural and loose brush strokes illustrates her ability to communicate mood and atmosphere using few brush marks. 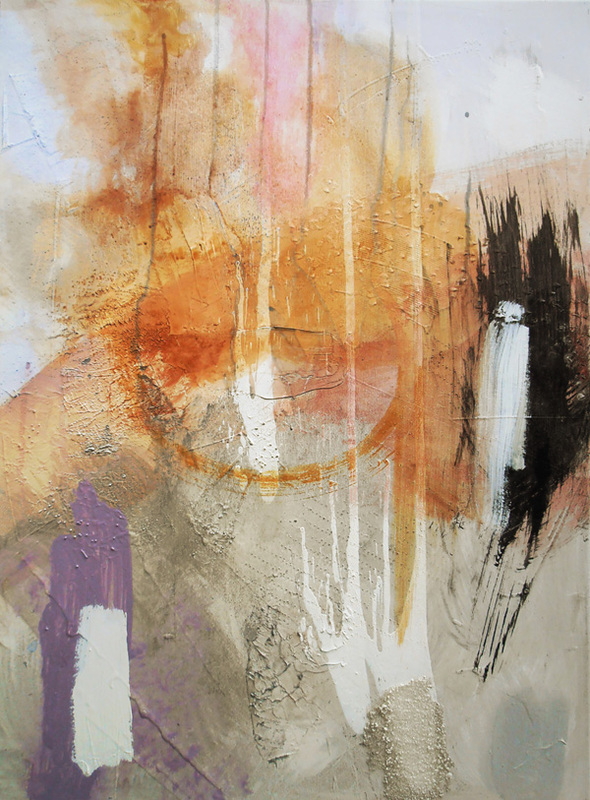 Gary Wragg talks to Matthew Collings… Very worth while combination! Abstract Critical has some very interesting articles in it. I shimmy along for a read from time to time. Keeps the brain matter challenged. I am not an academic by nature, but I have always enjoyed critical analysis. Come to think of it, it was one of my strong subjects when studying Literature at Kingston University. Some of the “Signs of the Times” are at Baker Tilly in Guildford at the moment. 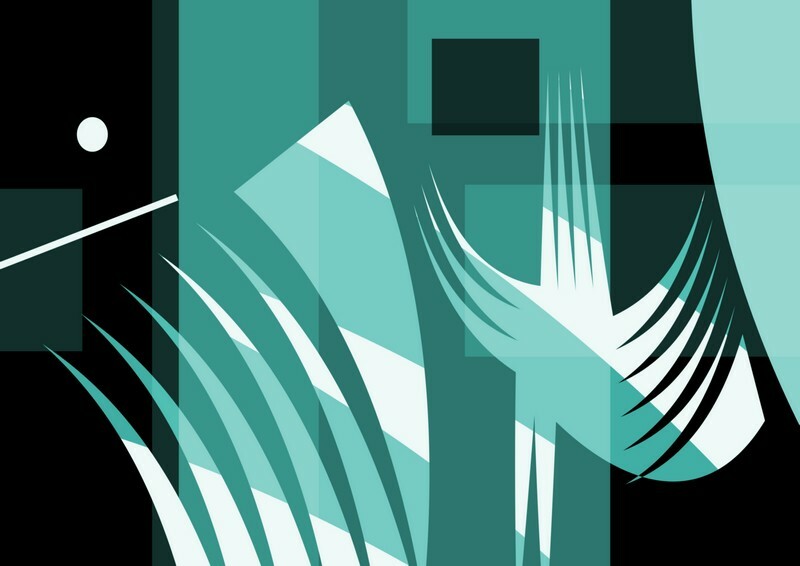 That was a useful body of work for me…Going all geometric like that! And advertising annoys me terribly. How much better to have signage which simply says what it is… and doesn’t impose some sense of what you might be lacking, or creating some need or desire that you don’t feel yourself. Advertising creates a market for what someone wants to sell even when the market doesn’t exist….I do wonder about this. This strategy to make us buy. This way of selling. We are surrounded by it to such an extent that the confusion it causes can become difficult to discern. But my signs are my times. Simple. Straightforward. As they are. We can be as we are. There is a huge conflict between knowing and unknowing. I feel it a lot with my work especially, just wanting to know what is happening. In reality, I haven’t a clue, though I speculate, right, think, and suggest. This Journal is as stumbling as it will always be. But I like writing. It is some kind of reflection, at least. I am trying to keep my Jenny Meehan WordPress Journal a little more brief than in the past, so that is it for now! *Notice regarding my use of images on my Jenny Meehan Artist’s Journal blog: I always try and contact the relevant artist if I include images of their work on my blog and make clear the source. Where images are taken from other websites, I make it my practice to cite the source and often include a link to the place where the image was found. If this is not possible I will include a fair use rationale. When I include images I do so in the belief that this will not cause commercial harm to the copyright holder. I believe that this is fair use and does not infringe copyright. Images are used in order for me to comment and reference them in relation to my own creative and artistic practice. When I include extracts of text, I also do so with the understanding that again, this is permissible under the widely accepted fair usage terms with respect to copyright. I am not sure if I have posted this up already.. Had a few problems once when writing a post, and got muddled with the different versions, so if this is a repeat, well. Don’t worry, it’s me, not you, who has gone double! Very textural…which you cannot see too well here! Artists Beware! Amusement and Depression! We simply don’t command what we are worth. Well, maybe toned down a little into “It is easy to undervalue art working”. This is the conclusion I have come to regarding art working in all its forms. This article below, by Alistair Gentry is highly amusing, sobering, and maybe slightly depressing! While amusingly extreme, it’s wise to take note of what the situation often is…Not always, not necessarily so extreme, but I have suspected much of this for a while. I have very limited experience and Alistair Gentry has a lot. So I do mark his words! I think the “answer” is to simply make sure that what you do does work for you in the way you want it to. Our reasons for doing things are many, and the bottom line is that the reason you ultimately choose to do something is because it means something to YOU. How you go about getting it around, how you use your skills, how you choose to invest your time and money… Make your choices but whatever you do, don’t delude yourself that the substance of what you do is going to be realised in recognition, status, or money. It might be, but this is a side issue. Put your heart into your art working and do it for the value it brings to your life and try to educate others as much as you can as to why art working is valuable, and exactly how it is. Think about it for a start… Why do you bother then? How do you show this? How do you talk about it? What difference can it make to someone’s life? Why does it matter? “We simply don’t command what we are worth.” Is me quoting myself! I had better listen! It is not rooted in a sense of self importance or inflated idea of the value of my own work, but more the conclusion I have come to through thinking about why art does matter in society and culture. We have to have useful, transferable, competent skills and be willing to share them. Useful, interesting, and thoughtfully reflective insights into the human condition which come from time invested into what is, at it’s root, a contemplative practice. And the value of the practice and it’s produce needs to be encouraged, not exploited, by the way things work in the “art world” (whatever that really is!). I think it quite possibly nothing to do with art. In my realistic moments I also conclude that business will always be business, and this is a ruthless and money minded matter. I’ve resolved myself to continue to re-think and review what I do and why. How I invest my time and money. I’ve built up a bit of an exhibition history now, which can have it’s uses, but my heart is not in it. As a trail or path in itself, it does not lead anywhere. It is more what happens inside of us, and with our relationships and connections which matters, not some illusory idea of recognition or value based on ever shifting sand of whim, personal taste, or an idea or relative importance and value. Only history holds the real answer to what ends up having stood the test of time, and even that is selective and not entirely reliable as a gauge of value, though it certainly indicates impact. Many wonderful women have sadly been left out of the big art history trail! On an optimistic note, just to balance out the extreme despair that could easily assail one if only thinking down certain lines, I have also found that, as well as many rather dry experiences in my efforts to share my own work with others, there are very many exciting, interesting and worthwhile artistic ventures happening. People researching certain themes, for example, the wonderful “Speaking Out – Women Healing from the Trauma of Violence” by Dr Nicole Fayard (University of Leicester 2014). This project was a fantastic example of art working being explored in a very interesting and positive way, and for good end too, raising awareness of trauma recovery and art, bringing insight and information regarding social issues, sparking off discussion and establishing connections between people with common interests and passions. Being part of that project has given me far more than I expected it to. Not only has the process of working through some of my own tangled thoughts been quite helpful, but it has been inspiring and motivating to understand and recognise the value of art working in relation to trauma recovery, and this pushed me along a path I had started to walk on just that little bit further. The above extract is from “Going Slow” a sermon preached by Michael Sadgrove on 10th February 2013 http://www.durhamcathedral.co.uk/worshipandmusic/sermon-archive/going-slow for the whole sermon, which is a good read. As someone who often, for some odd reason, sometimes makes life much harder than it needs to be by overreaching, in terms of giving myself unrealistic targets, the sermon “Going Slow” is a timely reminder that a hectic pace is not the way I want to live my life deep down, and not the way to position myself to my best advantage I don’t think either. Thankfully I tend to recognise fairly quickly when I make my schedule unrealistic, and manage to adjust things accordingly by making a reassessment of priorities…it hasn’t got me into any trouble yet and I hope will not in the future, but it has caused me unnecessary stress at times. I think that one of the reasons I find the contemplative way of life a great aspiration and the way forward for me is probably in that it counteracts my natural tendency to associate achievement and doing with being worthwhile as a person. I continue to shake this delusion off, and it will be a long term task, I am certain! This article on Oil and Acrylic Paints is one of the most thorough I have come across, and I do just love my paint research. I have such an interest in it, I know for sure I am obsessed with paint, because it defies all reason. I could quite happily spend an hour a day reading about technical matters regarding the use and qualities of different paints. Well, there have been some days when I have done this… Finding an in depth article like this one from Golden Paints “Just Paint” publication does save a lot of time though, so I hope it is useful to you if your interests lie in that direction! If not, there is no doubt something else that you would happily spend an hour reading about! Copyright Clyde Hopkins. Permission to use has been granted by the artist. Oh, this one, yes. This may be my favourite. ( I can see my plasticine cut well). What is more, there is an egg which lies waiting underneath the ground. I am slightly concerned at this point that my comments and response are rather simplistic. However, who cares but me, and only for a moment. Plus, this is probably a good thing. My logical and intellectual brain, while useful, sometimes robs me of a lot of pleasure. I love allusions to growth and the organic, and find them here in this painting, with a sense of being below ground level, which is also something which has held an interest to me for many years. It was the only part of geography I enjoyed…rock formations, glaciers, volcanoes, different types of layers on the earth’s surface. All so much better than towns, houses and populations. There you are. Your intellect is now satisfied a little. There is certainly a feeling of drainage in the painting. And of forest. And of roots. It’s kind of odd, that part in the painting at the near top right, with it’s concentric circles rippling together, bringing it away from the flat surface into a space beyond the picture plane. But it doesn’t disturb me, and I think there is a patch of what I will call “mystic light” just where those light purple/lilac seed type patches are falling. So there is movement, light, and what looks like a fair amount of texture in the bottom right hand side of the painting (looking face on). Those things build an area which has pulled away from the flatness of the strata/cross section side, and so, all does look in accord. It works. The computer screen will be playing its part in distorting what the reality of the reflected light is, and so I am feeling deprived. But something like that is happening. It’s a joyous painting, and seeps a sense of experience, and experienced use of colour, which is delightful to me. I like organic forms in paintings and while I can appreciate paintings of geometric composition, and can imagine the freedom to explore various colours and paint applications within them, my eyes need the relief of a bit of undulation! I like paintings which are a pleasure to the eye…No shame in that. But ones which also challenge and stimulate. These paintings do all three, and, like all paintings, all kinds of other things which we have not a clue about, no doubt. I want to look at some more in future posts. On the “Will Do” list! I hold a preference for strictly geometric designs just being printed and flat. And no more. I found this out through my own “Signs of the Times” series. I was thinking about maybe translating some of them into paint, but couldn’t really conjure up the will to tear them away from their printed expressions, which were far truer to my intentions at the outset. Behind each one, there stood the thought that I had started working on them because I was sick to the core of advertising… sick of seeing all around me images which had the sole intention of pointing out some need and proposing the answer to it, all for commercial and business gain. And so I took the sign part seriously. I wondered how the world would look with, instead of adverts for products and services everywhere, it had simple statements of being or small phrases which simply hit you with no ulterior motive. Things like “Quick Dip” and “Putting Your Point Across” just expressed with no more message than that. No more meaning or intent than the fruit of me grappling with how best I could express inner movements of the mind and heart. Simple symbolic communication, which one could respond to without pressure. You could emotionally agree, or not. Simple as that. Inner experiencing. No demands. No pointing out of anything you may be lacking, may need, should have etc. etc. 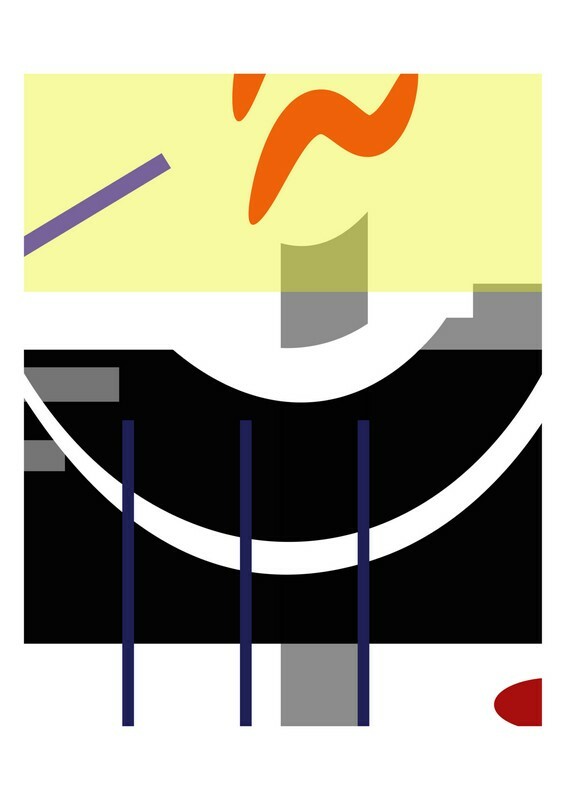 So I like the simple and the straightforward, and I like geometric design and paint encountering it. I like them apart and I like them together. But in my own painting I want the challenge of the relationship between the geometric and the organic/lyrical. There is something which is more “giving” about it. My mind just doesn’t respond to straight lines that well, maybe. It is interesting for me to take note of others work and I don’t have the time to put everything which strikes a chord in this Journal, but hopefully I will have some trace over time, of things which have helped me to discern my own creative path. It is though recognising something you like in others work that you get some sense of what your inner interests might be. I think it possible that seeing what you like around you, you see it with eyes fresher than you could have for your own work and that this can encourage you and validate the little stirrings which you are starting to feel inside yourself. I still remember wandering round some art fair (I cannot remember which it was) and finding my eyes only resting on Ivon Hitchens’ and Alan Davie’s paintings…everything else just seems to sink into the abyss! It was their painting alone which caught me completely… Nothing else seemed significant. We search for significant form, and I don’t mean significant form in the Bell sense, but in the poetic. Something which calls back to us, like an echo, of what resounds within. As I make my way back from my psychotherapy session I often stop to sit by the Thames. Anywhere by water is my favourite place in London. I have rather “a thing” about water… and find myself drawn to it in both in the ways it is used symbolically, and as a real substance. I’ve always loved water…Been a bit of a “water baby”! I had only been sitting down for a short while when a man approached me, explaining that he was from “The Oldie” Magazine, and asking “Would I be willing to be interviewed?” Well, I had, as it happens, heard of The Oldie Magazine, but only because a writer who brought “London Downpour” from me last year happened to be attending one of their events in London, and I needed to drop the painting off there for collection. This was just as well, as I don’t think I would have said yes if I had not recognised the name of the magazine. Nigel Fountain…What a great name… For me to be interviewed by Nigel Fountain on the edge of the Thames, and to have the painting “London Downpour” connected in my mind with The Oldie Magazine, is something which makes my heart smile a little… I am a great believer in taking the time both to talk and to listen, and so this was handy for him, as I gave him a great deal of my time. It was so nice to be interviewed by someone so good at doing it well, and I feel very grateful for the opportunity to share some of my life experiences with him. I was very open about my life experiences, which I am not always… but I follow my instincts in matters such as these, and I feel in a place myself where the traumatic nature of quite a lot of my earlier life really does seem a very long way away. Though I work through some of the issues in psychotherapy/psychoanalysis, the fact that I have been able to work my way through them is starting to pay dividends in my ability to talk about them in a reflective and thought out way. It helps me to appreciate other people too. Surprisingly, I find, engaging in psychotherapy is not a selfish endeavour. It is self focused, but time invested in listening to one’s self is probably something we should all do a great deal more of. Being able to see yourself compassionately yet also critically, in a constructive way, can be also a way to allow more compassion into your heart when looking at other people’s life experiences. Why do we shy away from others pain and suffering? Why do we fear the vulnerability in each other, and make so many efforts to hide our common tears? Maybe because we have not faced our own pains and sorrows? I am writing this now very deliberately having not seen yet what Nigel Fountain has written! This is important to me because as a writer myself, I am interested to see how what I write now relates to what he writes when I get hold of it in just over a month (today as I write this is 22nd March). It is rather risky to talk very freely to journalists. Having had three other local paper journalists write articles on me over the last few years, I am very aware indeed of how their individual perspectives colour their work. You trust them to re form what you give them, and you do not know if their own distortions, which are bound to be there, are going to give a likeness which you feel ok about. But I was so impressed with his interview technique I am quite confident he will do an excellent job, and if I don’t like it, it is his work, not mine. I also really like the whole idea of what he does…Going around and interviewing random people…listening to their stories and making a piece of writing out of them. These chance encounters happen to us all the time in life. Just investing that little bit more time to find out about someone and to somehow allow them to open up a little more than they might do in a rushed interaction. Making time to make a connection with someone else, simply by showing an interest. It is much easier to flick on your mobile phone or tablet and interact with that. How many opportunities to communicate will our gadgets and technology close down for us, I wonder? Researching Julian of Norwich a while back led me to the final title of the painting below, which was first called “The Comforter” referencing Christ’s words regarding the Holy Spirit in the New Testament books of John: “Nevertheless I tell you the truth; It is expedient for you that I go away: for if I go not away, the Comforter will not come unto you; but if I depart, I will send him unto you.” I then expanded the title to include the reference to St Julian of Norwich, because my research and thinking, along with the writing of the poem, made me feel that the two works, though in different mediums, were one. I entered this in the Womens’ Interfaith Network exhibition submission process this year, but it did not get in, so I am taking this opportunity to show it for now! I would also like to include the poem I wrote in response to my studies of St Julian of Norwich and also another poem which I found later on by someone called Venetia Carse. The confines of our place. The cover, white on your arm , ready to wrap round me. I need the way forward. Is a heart of pain. Being wounded is not hard. All enter into our own cell. How far I have fallen! Able to be as we are in you. Because life is not easy. in the mist, rime, blackthorn, shine. grace guide our blind eyes … through. or glory in a cloud of swallows wings. to care for Earth’s sad frailty. Venetia Carse – A POEM inspired by Dame Julian of Norwich. This was published in one of the Julian Magazines, but I cannot remember which one, so apologies for the vague source reference. I normally ensure I give publication details, but this is the best I can do for this one, for now. Spiritual, poetic, personal painting type work. Experimenting with the relationships between image and word. An interest in the spiritual direction and creativity interface, mental health and well being, and trauma recovery. Using the psychoanalytic approach generally to increase self awareness in my own life and work, and the extremely delightful, wonderful liberating experience of living a life which is as Christ-centred as I can possible make it. Drawings (mostly life drawing), which I would like to take into painting also. Just started going along to the Dulwich Art Group about once a month. Very exciting to paint the figure from life. Colour, if used will be expressionistic. Black and white is more appealing initially, as it is the marks I am interested in right now. Rambling, on this blog. On and on and on and on. As long as I can. Free to do, because of the joy of skimming over the surface, which we are all very good at. I write, I like to write. Poet seems too grand a word, but I lean into that direction rather than other genres. Writing this journal is an indulgence. An interest in producing and developing/marketing a commercial strand, but one which I still feel has roots I can feel at least a little bit connected to. This might happen later, as my time is tight with household and family matters. I make little attempts here and there, but the reality is, other things are more important right now. A photographic strand, which has completely become black and white, and small, rather than big, both in terms of print size and time spent on it. I really need to put all my images from the past to good use… I have a lot of work I could use potentially. And other things too… I expect. A possible response might be … Sort out why you are doing what you are doing for yourself. 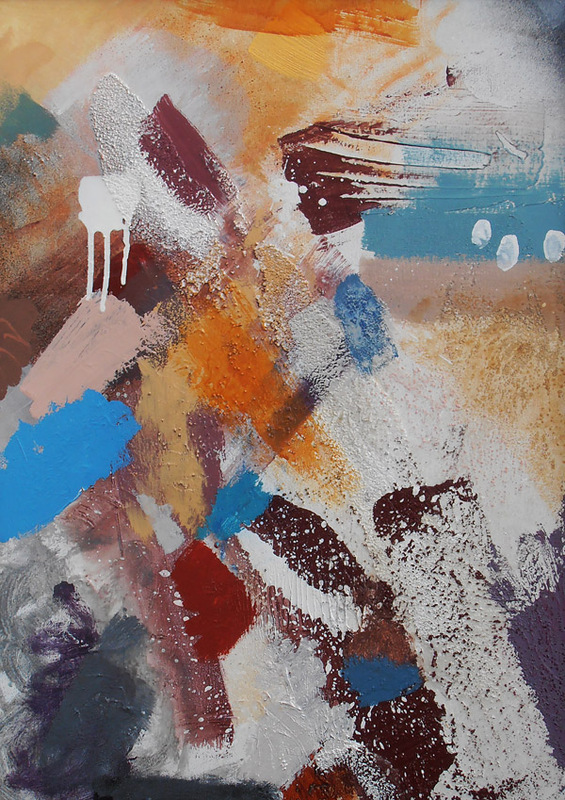 Jenny Meehan works mainly with either oils or acrylics creating both abstract/non-objective paintings and also semi-abstract work. She also produces representational/figurative artwork, mostly using digital photography/image manipulation software, painting and drawing. Both original fine paintings and other artwork forms (prices ranging from between £60 and £700) and affordable photo-mechanically produced prints are available to purchase. Enquiries welcome. I have more artwork than I can display on the internet, so let me know if you are looking for something specific in terms of style, function, or subject matter. Jenny Meehan exhibits around the United Kingdom. To be placed on Jenny Meehan’s bi-annual mailing list please email j.meehan@tesco.net requesting to be kept up to date. Also, you could follow the Jenny Meehan Contemporary Artist’s Journal at WordPress and keep informed that way.